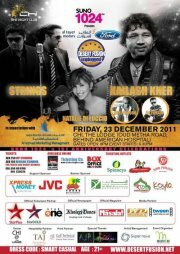 KAILASH KHER, STRINGS and NATALIE DI LUCCIO Concert! Live In Dubai. When these three come together, they create pure magic! Opening performance by Adel Farooq. Al Mulla Insurance Brokers LLC. Official TV Partners : Star Plus, Star Gold and Star One. Desert Fusion Unplugged! Suno! Sirf Suno!